LINDALE, TX (KLTV) - The Smith County Commissioner's Court voted to extend the disaster declaration Judge Joel Baker issued on Friday night. The Smith County fire marshal said 169 homes in Lindale were affected by the two EF-2 tornadoes, including 10 that were destroyed. 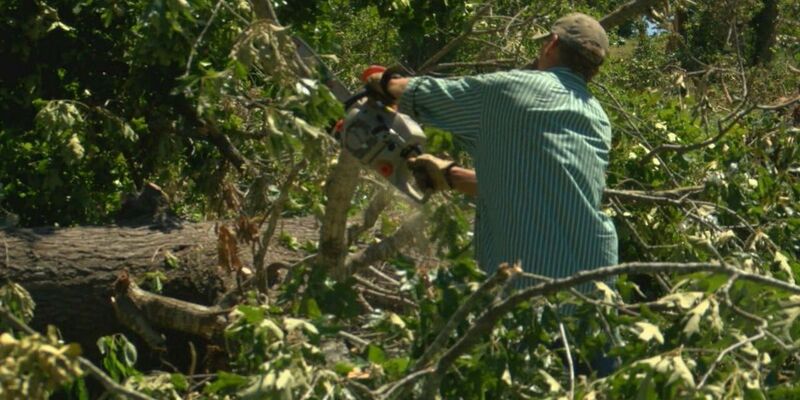 The sounds of chainsaws filled the air around Lindale Thursday as residents continued removing fallen trees and assessing the extent of the damage. "We are taking a bite, a very small bite, out of this very large elephant. A lot of trees down, a lot of roof damage," Temprince Harris said. "We're just basically trying to get it to a point to figure out whether or not it's going to be a total loss or if it's something that we'll be able to fix and rebuild, so had the insurance adjuster out because both of our vehicles were mangled pretty bad," Suzanne Transier explained. Both Transier and Harris and their families rode out the storm in the bathroom in their home. It's a night that's still vivid in their memory. "All the trees laid down and started circling," Harris said. "I felt it actually pick up (the house) and slam back down," Transier added. Evidence of the destructive power of this tornado is all around you in Lindale. And people who lived through the storm say it's going to take them time not just to get everything cleaned up but to get over the shock of what happened. "We bought this home as a starter home for our family, you know, we had a lot of memories in the house and they're gone," Transier explained, wiping tears from her eyes. "You know, you think you get to a point where you can talk about it without crying and it just doesn't happen," she added. But, everyone is just thankful that their families are safe. "I've been saying this and saying this: this is our finest hour. Not one person lost their life.That is the beauty of believers going to Christ and him answering," Harris said. The Smith County Fire Marshal said the damage from any homes without insurance has to be reported to the state and meet a threshold amount in order for the county to receive any disaster assistance. The Fire Marshal's office can be reached at 903-590-2652.